In the summer of the year 1575, one of Tokugawa Ieyasu’s officials, Oga Yashiro treacherously wrote to Takeda Katsuyori, Shingen’s successor, telling him that he would throw open the gates of Okazaki, the capital of the Tokugawa clan so that Takeda warriors could capture it. Katsuyori was delighted, thinking he could destroy the Tokugawa clan for once and for all. Katsuyori promised to reward Yashiro for his treachery once the Takeda warriors capture Okazaki. Gathering a force of some 15,000 men and some of his best generals, Katsuyori marched to Okazaki. Unfortunately for Oga Yashiro, someone informed Tokugawa Ieyasu of his official’s trwachery. Ieyasu had Yashiro arrested. Yashiro’s wife and four children were crucified while he was tortured and publicly humiliated before he was executed. The gates of Okazaki was closed just before the arrival of the Takeda’s warriors. Frustrated, Katsuyori was forced to leave Okazaki and tried to attack Noda Castle, another Tokugawa fort. When he failed to capture Noda Castle as well, he turned his attention to Nagashino Castle which would mark the beginning of the decline and the end of Katsuyori and his clan. Nagashino Castle was defended by Okudaira Sadamasa, a young samurai who rejoined Tokugawa clan after Takeda Shingen’s death. Sadamasa and his father were originally retainers of the Tokugawa clan, but they were forced to join the Takeda. They left the /Takeda clan with their men when Katsuyori took over the leadership of the Takeda clan. Enraged by what he perceived as a treachery, Katsuyori had Sadamasa’s wife, brother and a female relative crucified. From then on, Sadamasa and his men made bloody forays against Takeda’s warriors from Nagashino Castle. Katsuyori came back with a vengeance. He was determined to overrun Nagashino Castle. Okudaira Sadamasa defended Nagashino Castle with only some 500 men. However, they bloodily repulsed Takeda’s repeated assault, causing many casualties. However, outnumbered by a force 30 times larger than his own men and running low on supplies, Nagashino Castle would have fallen if not for the effort of one of the defenders, Torii Suneemon. Suneemon offered to sneak out of the castle by swimming in a river to inform Tokugawa Ieyasu of Takeda’s onslaught. Suneemon swam out of the castle on one night and managed to bypass the besieging Takeda samurai unnoticed. Torii Suneemon informed Tokugawa Ieyasu of Nagashino Castle’s dire situation. Shocked by the news, Ieyasu implored Oda Nobunaga for assistance against Takeda forces. Nobanaga sent a large army which includes 3,000 arquibuisers (samurai armed with muskets). The combined Oda-Tokugawa alliance numbered some 38,000 men. They marched to Nagashino Castle to aid the besieged defenders. Torii Suneemon was ordered to return to the castle to inform the defenders that help was coming. Unfortunately, Suneemon was captured by Takeda warriors outside Nagashino Castle while he was trying to sneak back into the castle. Takeda Katsuyori forced him to yell at his comrades that no reinforcement was coming and they would be doomed if they did not surrender the castle. He promised to spare Suneemon’s life and reward him ifhe agreed to lie to the delenders. Suneemon pretended to agree. However, he shouted that reinforcement was on the way and the yshould continue to resist the Takeda warriors. The enraged Katsuyori had Suneemon crucified. The defenders were moved by Suneemon’s brave sacrifice and were determined to continue resisting. Meanwhile, Oda and Tokugawa warriors arrived to aid the defenders at Nagashino Castle. Their combined forces were more than double the size of Takeda’s forces. Apart from that, Oda’s forces include over 3,000 arquebusiers. They set up wooden barricades along their defensive line in the plains while the arquebusiers placed themselves just behind the wooden barricades. This would make any charging infantry and cavalry vulnerable from being shot down. Takeda Katsuyori discussed the next course of action with his generals and senior retainers. Most of them advised him to either withdraw his forces or make a last push at Nagashino Castle. They argued that his forces would be easily cut down if his forces charged headlong at the defensive lines. Unfortunately, the impulsive Katsuyori ordered them to make a direct charge at the enemy. His generals pleaded with him not to make such a charge as it would be suicidal. However, thinking he would lose face if they withdraw to Kai, Katsuyori refused to change his mind. 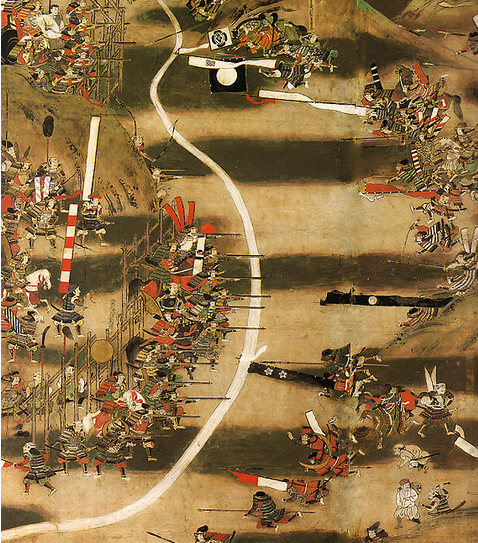 On the next morning (29th June 1575), Takeda cavalry and infantry forces charged at their enemy with great ferocity. In what was similar to many of the Japanese banzai charges at American forces during the Pacific War in the 1940s, many Takeda samurai were shot down before they could reach their enemies. Some of the Takeda warriors managed to break through the barriers and fought with their foes. However, most of them were shot dead while they were rushing at their enemies. Soon, even the Nagashino Castle defenders came out of their castle and slew many Takeda warriors. Soon, Takeda’s men broke and fled. Many were cut down without quarters. The frustrated and stunned Takeda Katsuyori barely escaped with his life. However, he lost thousands of retainers in the battle. The greatest loss to the Takeda clan was the death of many of their capable and experienced generals, such as Yamagata Masakage, Baba Nobufusa, Naito Masatoyo, Sanada Nobutsuna, Sanada Masateru, Hara Masatane, Tsuchiya Masatsugu, and Yonekura Shigetsugu. From then on, the once mighty Takeda clan became a shadow of their former self and removed them as a key contender for power.